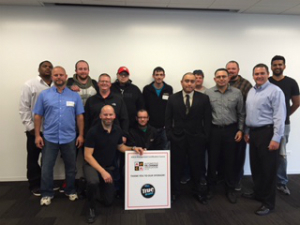 The following individuals participated in the Management Certification Courses in September and October. Jerald Beach, Texas Express Lube and Auto Inc.
Kirby Huber, Texas Express Lube and Auto Inc.
Don't miss your chance to increase your management skills over two days of intensive training. Host a private management certification course and we'll come to you. For more information visit the website or contact info@aoca.org. Click here for an overview, see what you can expect. AOCA is saddened by the passing of long time AOCA member and founder of Kwik Kar, Ray Ellis. Our condolences go out to his family and friends. Over the past 25 years Ellis' true success was getting his entire family involved in Kwik Industries. Today Kwik Industries is one of the most successful builders of car washes, oil and lube centers, and dry cleaners in the nation.' View the full obituary. AOCA Members, switch to Sprint and get 4 lines of unlimited talk, text and data to share - all while on the new 4G LTE and Sprint Spark network. Take a look at our flyer to see how Sprint compares to other providers and what your AOCA Savings 4 Member advantage is. AOCA would like to extend a warm welcome to Gena Parsons, the newest member of the AOCA team. Gena will serve as the front-line member services associate, ready to answer any and all member inquiries. A Wisconsin girl, Gena brings experience in event planning, fundraising and non-profit management to the AOCA roster. Fun fact: Gena is quite the movie buff and hosts a monthly themed movie night with friends. What's Hot in Fire Prevention? Equipment Maintenance! * What's Hot in Fire Prevention?